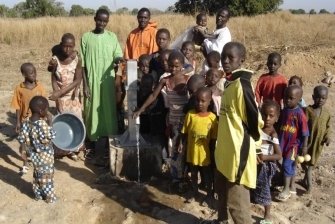 In many parts of the world, a shortage of good surface water means that to ensure the survival of a community, a well has to be drilled and a pump installed. This relatively simple procedure frequently presents a major problem in developing areas. Availability assistance is invariably expensive and the equipment is often too complicated to be used by anyone except a trained engineer. Recognizing this problem, VRM, with over 50 years of experience in well drilling technology, has specialized in the provision of the SWN80 handpump equipment for rural development; easily to transport, simple to use and requiring only limited maintenance then only after long period of operation. Furthermore, essential working parts subject to the greatest wear can generally be replaced with locally available materials, thereby reducing reliance on technical assistance or spare parts both of which may be difficult to obtain. The SWN80 is a simple – but effective – tool, and a simple way to establish a source of community water for drinking, cooking, washing, for the irrigation of crops and for ‘livestock’. A small investment will help these communities to develop. Worldwide operating aid organizations as for example Oxfam, Red Cross and Unicef are our customers for several decades. But also humanitarianism and/or religious driven initiatives often leads to rewarding results. To achieve succesfull projects fundraising has been proven to be a succesfull way to collect the required finances. We can imagine that these specific knowledge may cause you some ambiguities. Our sales and technicall staff will be pleased to assist you and will inform correct about your possible specific requirements and the possibilities VRM can offer. So, please contact us for further information and to discuss any you may have.